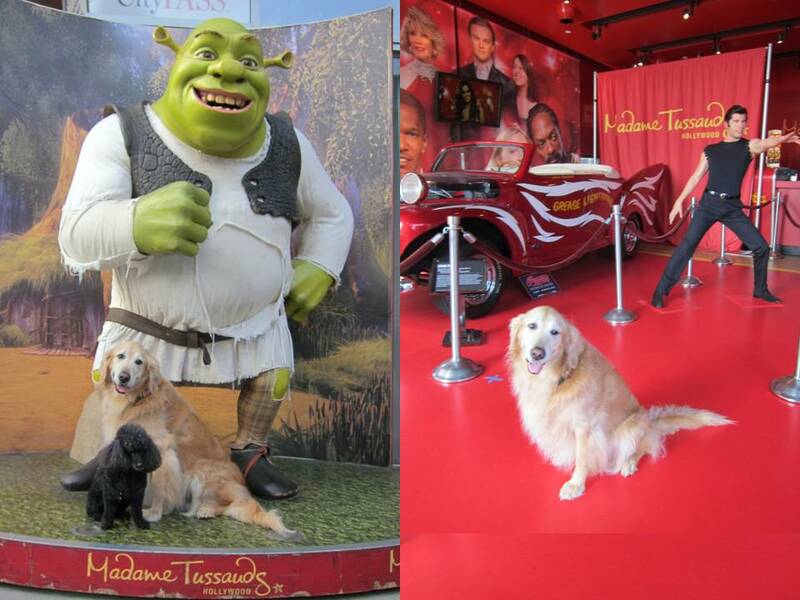 Hollywood Tour: Are they real ? Well it is now New Year's Eve. So that meant out came the party hats. I suggested a New Year's Eve pizza. Mom said no. So I told mini-me (that is what I call Annie) to follow my lead and look really sad. Rosy wanted tuna, so she didn't join in the pizza protest. I wonder if Mom will give in. Meal time is quite different around our house lately. 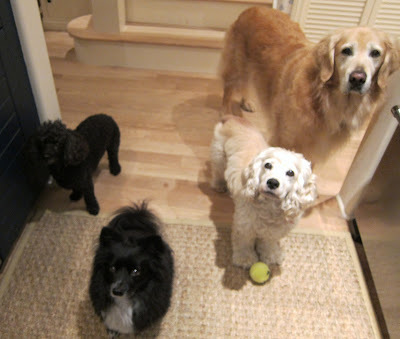 Now that Annie is our new sis, we are three dogs. 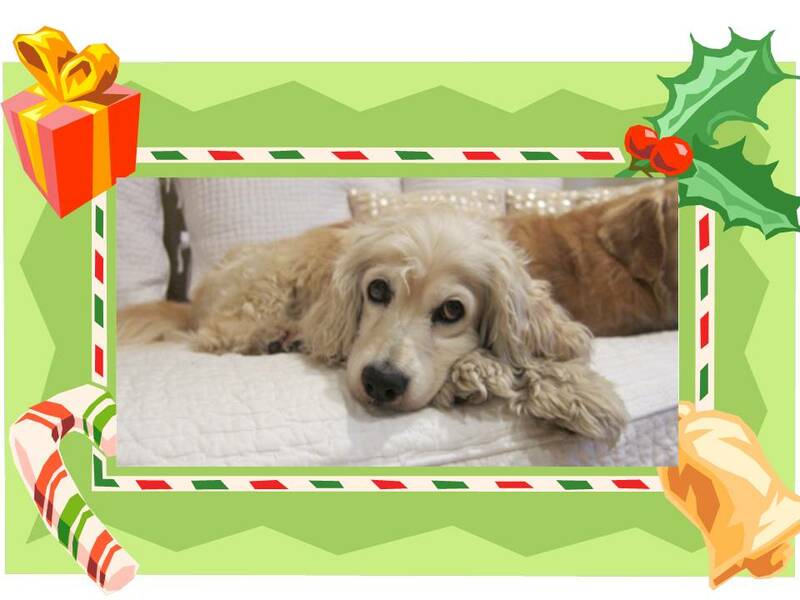 And with Bunnybell staying with us for a bit, that totals 4 dogs. That means 8 eyes staring up at Mom. That makes her a bit flustered. But I help talk Mom through it and remind her to breathe to help her relax. 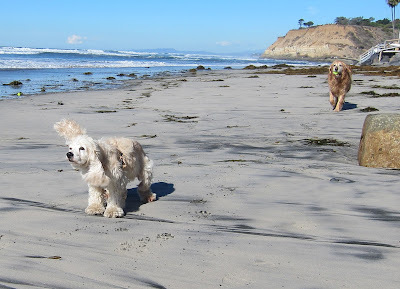 Annie went off leash at the beach the first time yesterday. I told her to follow me. She was a bit curious, and not that interested in the ball (she will learn). So then she started running in front of me and I called her to stop. She stopped and lifted her ear to hear what to do next . She is such a good﻿ sis. 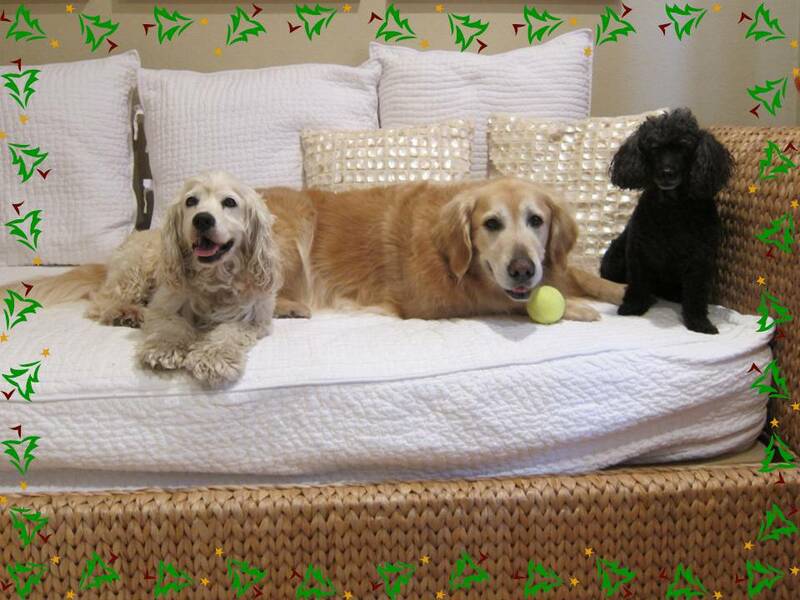 Of course we had to take a holiday picture in front of the tree. I wore a festive bandana, Rosy wore her fave dress again, Bunnybell wore her jingle collar. And Annie got her first experience of dress up. Mom put a big red bow on her. I have to admit, she looked totally adorable, but I don't want to encourage Mom. Remember I asked Santa in my dream to please find all dogs and cats forever homes? Well he sent one to my house! This is Annie, my new sister! Mom saw her on Facebook and went to the Orange County Shelter with Dad to get her. She is 10 years old like me. She's a really sweet Cocker Spaniel. We all get along OK. I just need to continue to remind her that she has to share Mom with me and Rosy. Oh yah. I haven't warned her about the costumes yet. Last night I had a wonderful dream. Rosy and I met Santa in this magical wonderland. 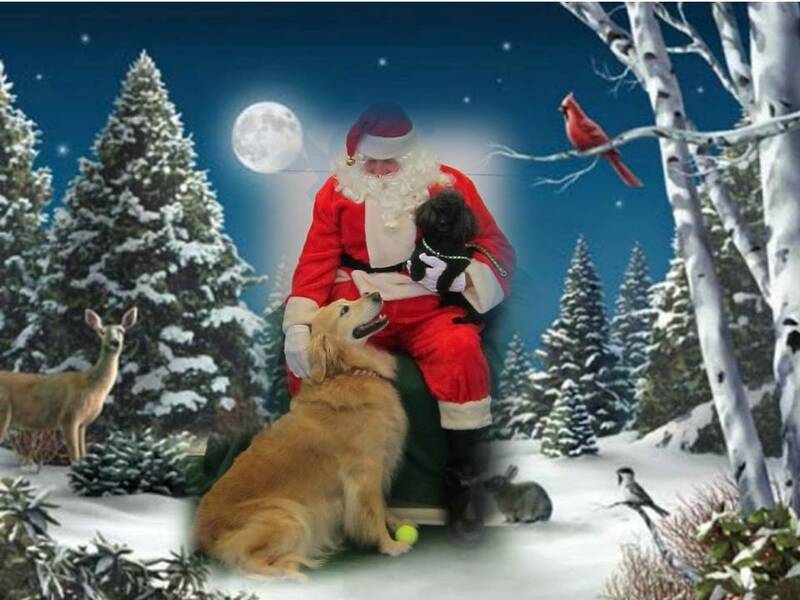 I asked Santa if he could please find all dogs and cats in need a loving forever home. I told Santa if that is too much to ask to get done by Christmas, if he could just keep all the animals safe while they wait to go home. I really hope this dream comes true. Mom told us to dress in the holiday spirit of Christmas today at the beach. So. Rosy wore her adorable Mrs. Claus dress and hat. And I got to wear the hat that I reminds me of Dr. Seus, one of my fave authors ! I wonder what my Dr. Seus character would be called? The Bear in the Hat? Mom and Rosy were so excited to find a Christmas tree outfit for Rosy. But I was afraid what was going to come next. I was right. Mom found my Xmas tree costume from last year and out came the camera. I guess I should be grateful that she didn't attempt to string any lights. Mom likes Rosy to wear pajamas at night when it is cold. Rosy seems to like it. Then the other day, Mom was unpacking a bunch of boxes, and said, "Bear, Rosy, come look!". And there they were, matching pajamas. And just my luck, it was cold that night. And of course, Mom had to take picture in the morning. How embarrassing. I thought I found the most perfect presents for my Mom and Dad. For Dad, he loves breakfast, so first there was Bathe & Brew - a coffee maker in the shower! And then Dream Griddle Alarm Clock that has your breakfast ready when you wake up! For Mom, I would get myself Pet Sweep boots so I can help make sure the floors are clean. And a Pet Petter to use when Bunnybell is over to give Mom an extra petting hand. Then Rosy pointed out that these were PrankPacks, not real products. Major bummer. A few weeks ago, I shot my first commercial video! 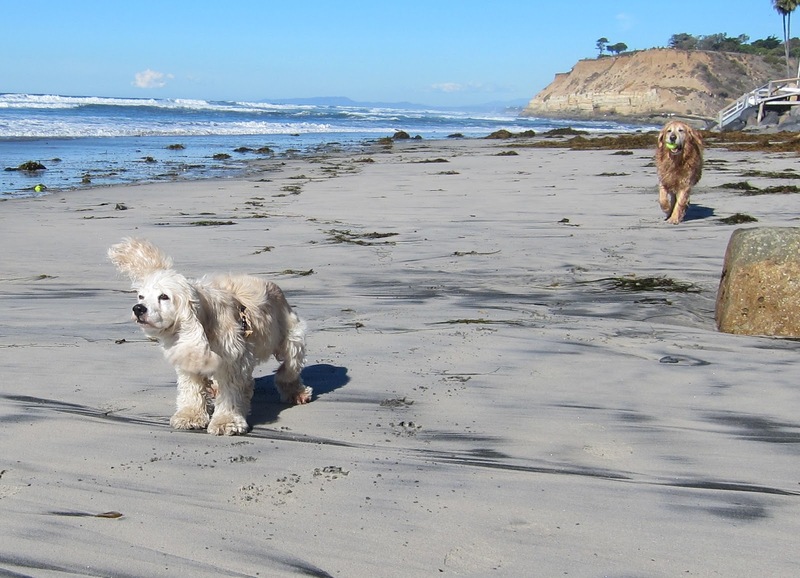 I had 4 dog costars and there were 5 main human stars including my sis Sydne. My main part was to be with Devon. I let her rest her legs on me and she gave me water from a champagne glass. Rosy got to lay out on the chaise with Shauna and play princess. Bunnybell was with Sydne and of course she had the eating part. You may wonder how I was paid. Well, I didn't sign a contract but I am hoping Sydne recognizes our hard work by ordering us pizza when she visits soon. I think that is fair. I work for pizza. 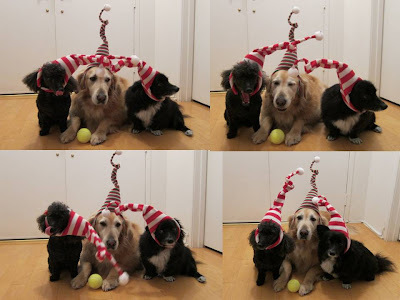 Mom was so excited to do the photoshoot with the newly purchased very tall striped Santa hats. 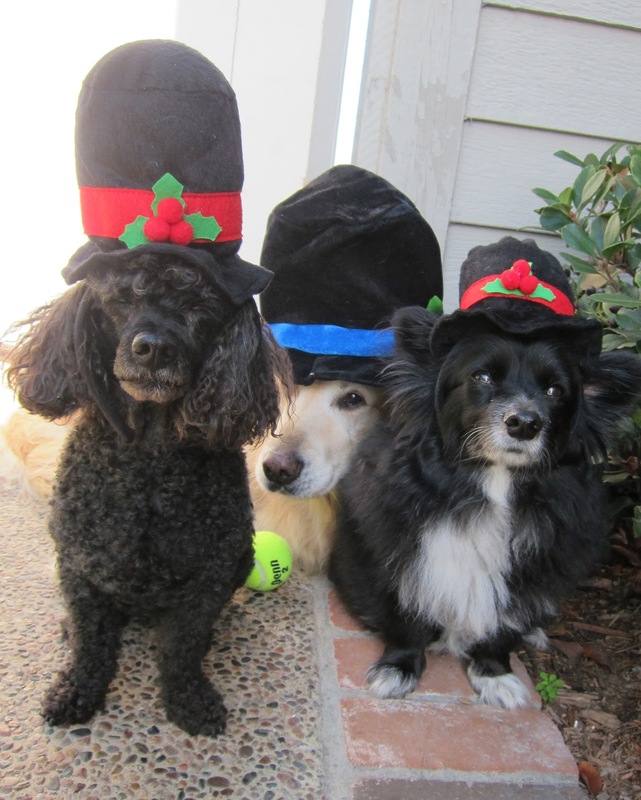 I thought the hats were rather silly, but I figured if I just stood still.it would be over soon and Mom would be happy. . However, Rosy's and Bunnybell's hats were way too big which caused them to keep falling and bonking me on my head. Everyone was laughing. I was not amused. Yesterday I was so excited to go tree shopping with Mom and Dad. When we arrived Mom told me that I was not allowed to pee on any of the trees. I soon found the perfect tree to buy (it smelled the yummiest). But we had to look more even though I was really tired. 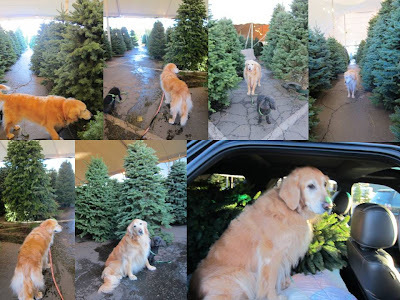 Then after looking at every tree on the lot, we ended up buying my tree. Then on the drive home I couldnt even lay down and nap because I had to share my space with the tree. Next year I will pass on the Christmas tree shopping. 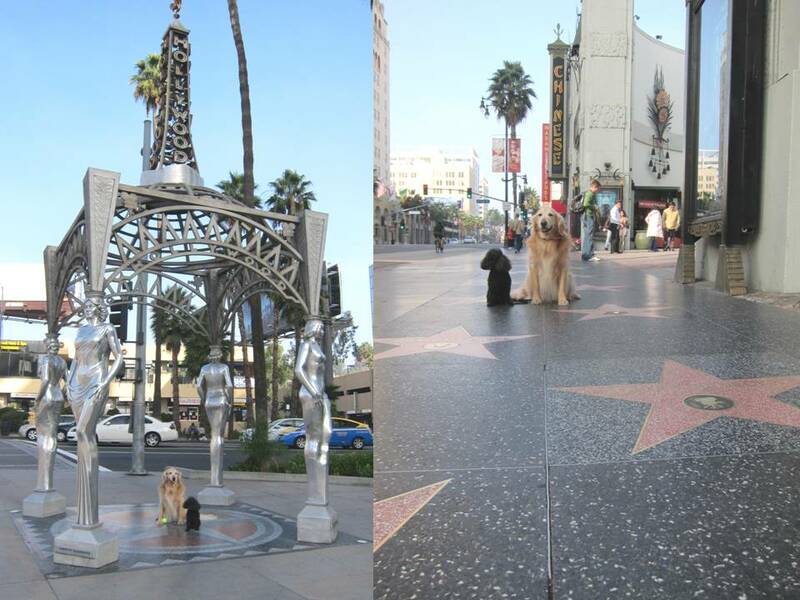 As my last stop on my Hollywood tour, I got to see famous celebrities. Marilyn Monroe, Shrek and John Travolta. I wanted to get their autograph and then Mom told me they are not real. They are from Madame Toussauds Wax museum . Weird ! They look real. Then I wondered, if I just stood still, would people think I am a wax AirBud? As part of my tour, I got to go to the Hollywood & Highland Center. 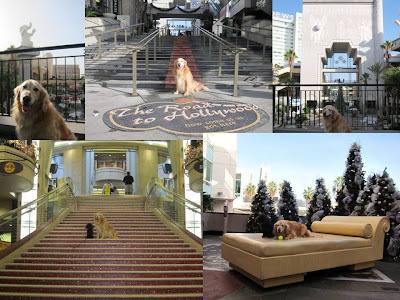 The first thing I had to do was go to the Dolby Theatre where they have the Academy Awards. We imagined climbing the stairs in anticipation of an Oscar. After we went into the main courtyard modeled after the Babylon set from the silent epic "Intolerance". We then sat on the casting couch for a while hoping to be discovered. Off the couch now, but still hoping. 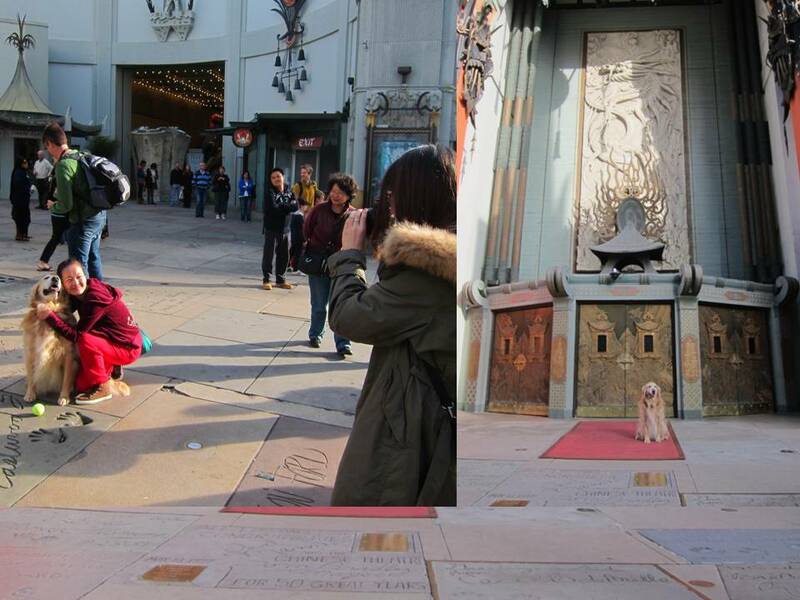 On my tour, I got to stroll on the Hollywood Walk of Fame. You get to walk on all these big pink stars, each with a name of someone in the entertainment industry. There are nearly 2500 ! At the western gateway, is a stainless steel gazebo called "The Four Ladies of Hollywood - (a tribute to the diversity of women in Hollywood, with actresses Dorothy Dandridge, Anna May Wong, Dolores Del Rio, and Mae West.) 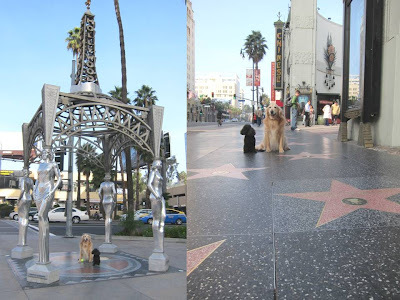 The only thing that disappointed me about the Walk of Fame is that only three dogs have a star (Strongheart, RinTinTin and Lassie). What about ScoobyDoo? I went up to Los Angeles this past weekend and decided to do a Hollywood tour. So first stop, the famous Grauman's Chinese Theater. In front of the theater is the Forecourt to the Stars where all the celebrities do their signatures and handprints. I liked Clint Eastwood's - it made my my day. And then I made some tourists day by letting them take pictures with me when they asked. I felt like such a star. 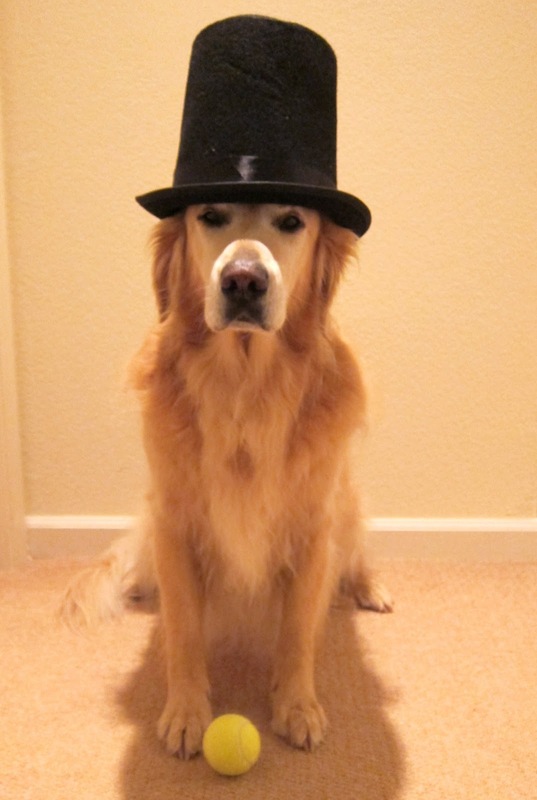 The other day Mom and Dad went to the movies and saw Lincoln , the new Steven Spielberg film. I asked what it was about. They said the it was the story of the how President Lincoln worked to get the 13th Amendment of the US Constitution passed that abolished slavery in 1865. That got me to thinking ... I wish I could be like Abe Lincoln. I would want to be a loved, great leader and push through an Animal Bill of Rights as the next amendments to the US Constitution. Well, I got the loved part, that's a start. 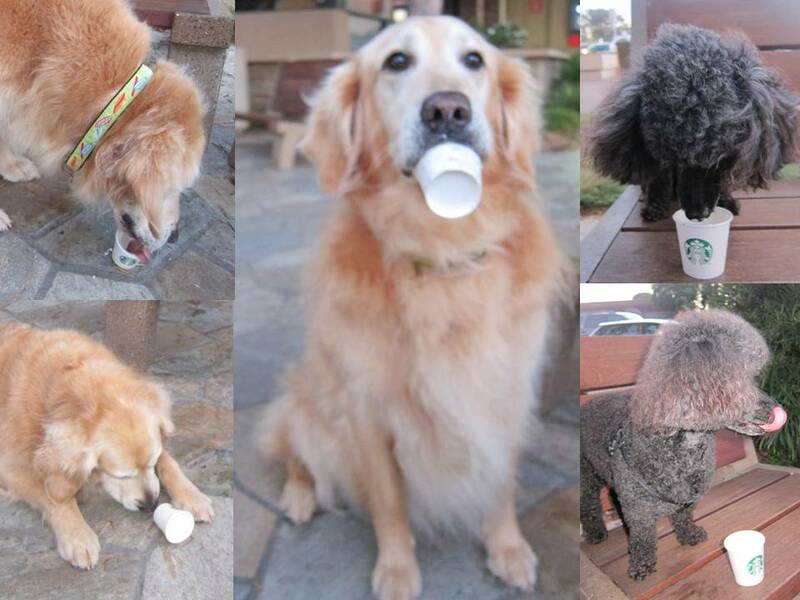 The other day we went to Starbucks with Mom and Dad and we had our first puppacinos. OMD! It was so delicious, I finished it immediately. Rosy on the other hand watched me finish and then savored hers slowly. It was killing me. I thought if I looked sad and adorable, maybe I would get some more. Mom and Dad said no. Bummer. Wouldn't you have let me have another? When Bunnybell was visiting, Mom wanted to do a photoshoot with our new snowmen hats. I really thought it would be cuter for just Rosy and Bunnybell to wear the hats and it be a snowgirls photoshoot. Besides, I thought my hat was really dumb. I tried to hide behind Bunnybell, but Mom's camera always knows how to find me.